This is the first in a series of posts spotlighting websites with outstanding copywriting. Let’s start with something a little silly. 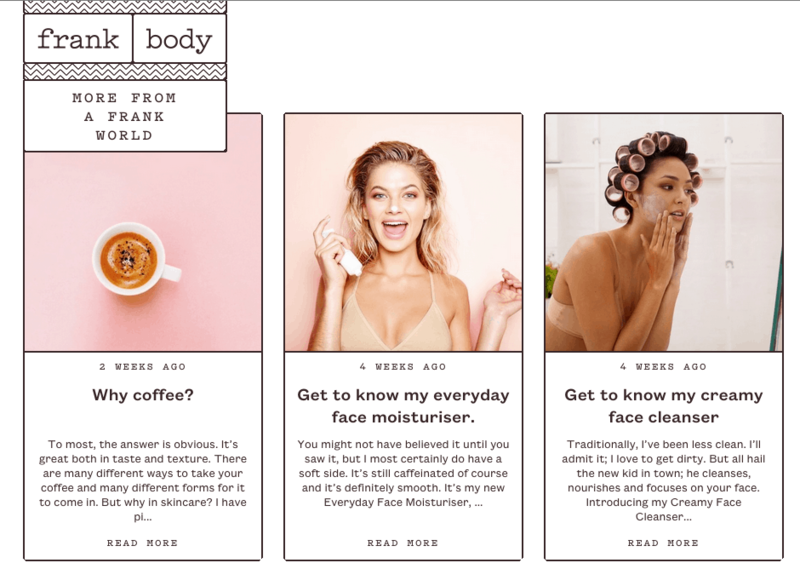 Frank Body is an Australian company that makes coffee-based skin-care products. The website copy is playful and witty, from the first-person quotes scattered throughout the site to the product descriptions, which are clever yet still convey some substantial information about what each one does. The consistent voice and style follow through from short and direct “about” copy (which manages to elevate product benefits into something engaging to read) to hashtags to regularly updated blog-style posts that explain how key ingredients work and recommend skin-care routines. Notice how the main display text is active and to the point. The only part of the website that doesn’t jibe perfectly with the rest, for me, is a section called #Let’sBeFrank. It’s an extension of the implied male voice behind the rest of the copy. “He” dishes advices to women from the perspective of a straight-talking guy pal, espousing opinions and what I think is supposed to be empowering messages on topics like wearing makeup, figuring out if a guy is into you, marriage and babies, and how to tell if you’re high-maintenance. I get that it’s supposed to be funny, but to me it feels contrived—like someone couldn’t pass up the opportunity to use “Let’s Be Frank” again somewhere in the marketing and so thought this up. But that’s such a minor, totally personal quibble—and maybe many other people do find the posts funny and share them on social media. Overall Frank Body takes a refreshingly fun and playful approach to branding for a product that’s cool, but if you think about it, not so, so groundbreaking on its own. Infusing a lot of personality adds to its allure, and works to build the sort of cachet that defines other, successful niche beauty brands.